Electricity shortage reaches 21,000 Megawatt (MW) in Java and Bali, therefore the construction of power plants must be accelerated to meet demand of power. The statement was made by President Joko ‘Jokowi’ Widodo in his remarks at the groundbreaking of Lontar Extention Steam-fuelled Power Plant (PLTU) in Lontar Village, Tanggerang, Banten, on Friday (10/6), as part of the Government’s 35,000 MW electricity program to meet people’s demand by increasing the electricity supply in Jakarta and Banten as well as accelerate the development of electricity infrastructures. “If we do not accelerate the development, Java and Bali will experience electricity shortage in 2019 and the provinces will be hit by electricity outages. Therefore, I persist the 35,000 MW power plants development project all around Indonesia to be accelerated,” the President said. There are several problems in the development, particularly regarding permits and land acquisition. However, the Government at provinces and regencies will continue to cooperate to address the deficiency in electricity and meet the electricity needs, the President added. On that occasion, President Jokowi called on all ministers and Managing Director of State-owned electricity company PT. PLN to monitor the condition on the ground regularly, so they will understand the problems arise thus they can solve those problems as soon as possible. One by one, the construction of power plants from Sabang to Merauke will begin. The President believes the target to generate 35,000 MW electricity can be fulfilled. Lontar Power Plant as a part of PLN main unit project in West Java can generate 3 subsystems: Balaraja, Kembangan, Muara Karang-Gandul subsystems to Jakarta and Banten. The power plant was built on 11 hectares of land as the continuation of power plant existing projects units 1, 2, and 3 that have been operating in Java and Bali with total capacity of 945 MW. “The construction of Lontar Extention Power Plant is expected to be finished in the next 42 months and starts the operation in September 2019. The target is faster than other power plants,” Managing Director of State-owned Electricity Company PT. PLN Sofyan Basyir explained. On that occasion, President Jokowi also inaugurated Distribution and Transmission Plants for Java and Banten. 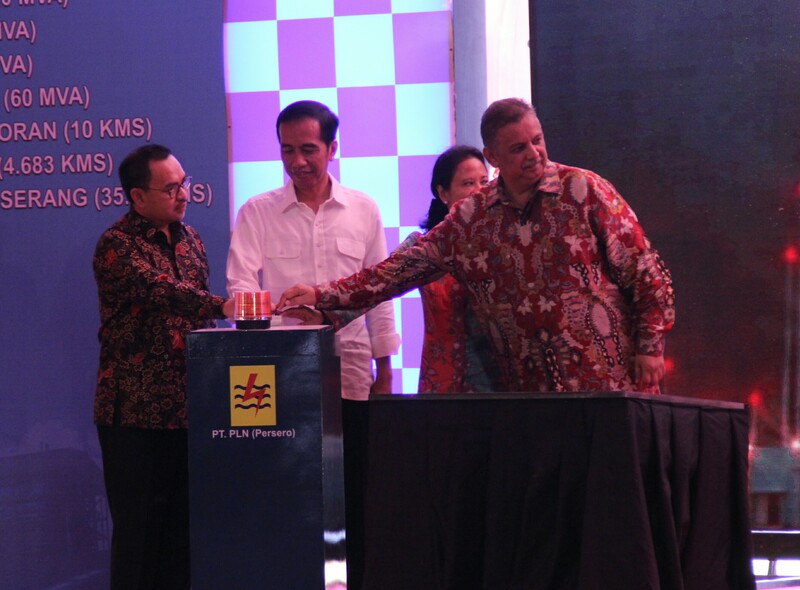 The inaugurated projects which has started operating in Banten and Jakarta are 500 Kilovolt (kV) Balaraja High Voltage Distribution Plant (GITET) with capacity of 2×500 Mega Volt Amp (MVA); 150 kV distribution plant with capacity of 2×60 MVA transformer; Reconductoring 150 kV Cilegon-Serang Extra-high Voltage Power Lines (SUTT) connecting 35.91 km; 150 kV Bintaro II Gas Insulated Substation (GIS) with capacity of 2×60 MVA transformer and 4.68 km length 150 kV Bintaro-Bintaro II UGC; 150 kV Pantai Indah Kapuk Distribution Plant with capacity of 1×60 MVA transformer; 150 kV Gunung Sahari-Kemayoran GIS with capacity of 2×60 MVA transformer and 10 km length 150kV UGC; and 150 kV Bayah Distribution Plant with capacity of 1×60 MVA transformer to connect PT. Cemindo Gemilang, a customer of high-voltage power in Bayah Subdistrict, Lebak, Banten. Meanwhile, Distribution and Transmission Plants which has just started its construction are 500 kV Bojanegara–Suralaya Air Line Extra High Voltage (SUTET); 150 kV Cable Channels High Voltage (SKTT) in Muara Karang Baru-Muara Karang Lama, 150 kV SUTT in Cibinong-Gandaria, and GIS Depok Baru II.